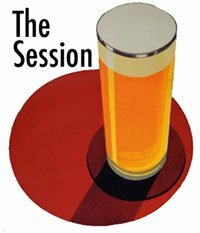 This month's session is finally brought to you by Pete Brown, a man who should need no introduction to any real beer aficionado. Well at least this side of the Atlantic, I have no idea how well known he is in the US or outside of Ireland and the UK for that matter. Pete was meant to host a few months back but his laptop jumped into someone else arms and went AWOL meaning he lost all his work on his latest book. Hopefully Pete has now learned about backing up work and has employed the powers of dropbox or something similar. That's the topic Pete as picked for us this month. Three simple words, one phrase and a hell of a lot of leeway because we have to wrote about what that phrase evokes in our soul, what images spring to mind, what the hell it means to us. Or we can just wing it and write utter bollox and end it all with "and that's the beer moment". So what does it mean to me? That's the question being asked and I wonder how I can describe it without coming across as a newbie and an Alcoholics Anonymous meeting. To me, the beer moment is that moment of bliss when you get home from work and know you have no where to go, nowhere to drive to and can just put your feet up and take that first sip of frothy, bubbly ambrosia and you just know that everything is going to be OK. You might have had a rubbish day, been cut off and almost rammed by muppets who don't know how to use a roundabout. Maybe you feeling a little lonely. Maybe you even feel on top of the world but when you take that first sip of beer, the world becomes a football you can kick around. It's not even the alcohol that produces the feeling because after one sip, it has not even had time to make it to your stomach let alone cause any feeling of drunkenness. In fact the beer moment does not even have to be that first sip, it can be the anticipation as you pour from a bottle or from a tap if you have beer on tap at home like I do. Of course this example is of someone at home after work but what if you go out to the pub and meet some friends? Or even on your own and decide to make some friends while there? The setting and circumstances have changed but the end result is the same. You lift your beer but you don't take a mouthful, Jaysus no, that's for drinkers of pale yellow fizzy stuff. No you slowly lift the glass and take a big sniff taking in the aroma, even if it's a boring session beer, hell even if it's a glass of pale yellow fizzy stuff you still want whatever aroma is there. Then there is a pause and finally to the lips we proceed. Down goes the first mouthful and it's only then that you realise that time almost stood still for a few moments. Sound was muted, motion was slowed and when you take your first mouthful, everything starts back to normal speed again. This is probably more or less what happens to everyone who loves beer, more or less anyway. So if it's not the alcohol then what is it then? Saying The Beer Moment makes sense but I don't know if there is such a thing as The Wine Moment or The Vodka Moment. Perhaps there is a Whiskey Moment, I might be inclined to have similar feelings if drinking a whiskey but it's not the same for me. That's how I know I am not an alcoholic even though my whole family seems to think I probably am. I don't crave alcohol, I crave beer. If there is no beer available to me then I drink water. Actually even if beer is available I drink water on the side to keep hydrated. I have a full bar at home packed with various alcoholic drinks but if I run out of beer, be that my own beer or commercial beer, I don't fall back on the dozens of bottles of alcohol I have. I go to the tap and pour a glass of water instead. If I make a cocktail for my wife I take a sip to make sure it tastes OK but I don't make one for myself. The only non beer alcoholic drink I go for is Whiskey and even then I drink it rarely even if I have some available. So why does beer evoke such a strong sense of loyalty in me? Why does beer give me that blissful feeling when other alcoholic products do not? I don't know but considering I'm not the first person to feel that way. Certainly 6000 years ago the Sumarians discovered the beer moment. It was a divine gift from the Gods and that thought stayed with the human race until quite recently actually. It was not that long ago that microbiology became understood and it was found that yeast is the stuff previously referred to as godisgoode. If you have made it this far then congratulations. I hope it was not too much waffle for you to stomach but that's how I feel. Nothing else makes me feel the way that first beer does, except of course seeing my wife after an absence. So in summary, The Beer Moment is that first beer of the day when everything falls into place and life is always good and not much else does that in the world. If you are not participating in the session but would like to leave a comment on what it means to you then by all means either leave a comment below or mosey on over to Pete's article and comment there. Oh and may the fourth be with you.